“Before I formed you in the belly, I knew you. Before you came forth out of the womb, I sanctified you. 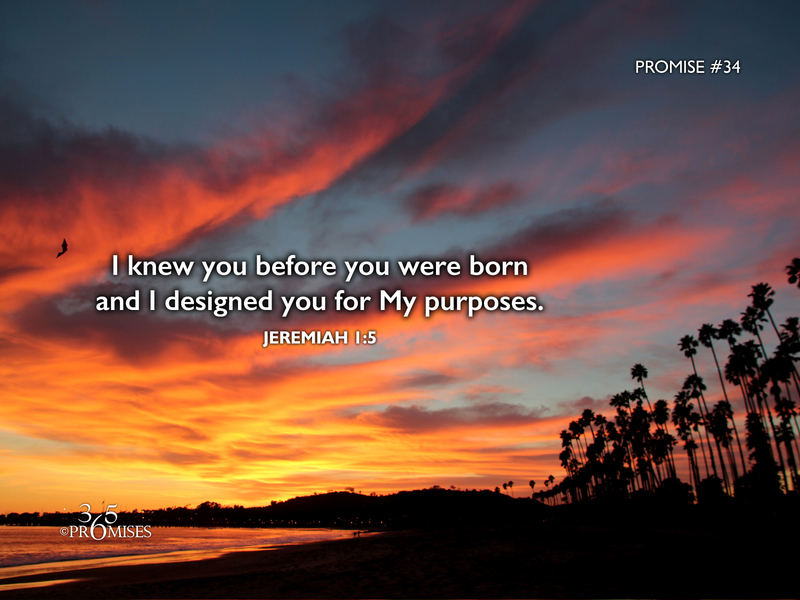 In today's promise, God is speaking to the prophet Jeremiah and reassuring him that before he was even conceived in his mother's womb, God knew him and designed him for His purposes. I don't know if you have wondered about this Bible verse before, but I have. How could God have known Jeremiah before he was even conceived? The best way that I can try to comprehend it would be if I compared our creation with how an architect designs a building. (I realize this analogy could never adequately describe the creation process, but it helps me to grasp this promise.) Before a building is built, it has to be designed by an architect. In the design process, the architect spends much time thinking about the plans and purposes for the building He is going to create. No detail will be too small for the architect to overlook. Even though the building is not yet created, He has already created it in his mind and then he commits the design to paper. When I think about how God says that He knew us before we were conceived, I think that He carried our design in His heart before the creation of the world and knew us intimately before the wonderful day of our conception. If you have ever felt misunderstood by anyone, if you have ever felt alone in this life, may the promise that God knew you before the foundation of the world bring great comfort to your heart today. You are His workmanship, created in Christ to accomplish His special purpose!